These backstops are made of #36 nylon netting, rope bordered with four 2 in. rings. Additional attached rings supplied at $1 per ring. Nylon netting is dyed black and bonded for protective weather treatment. 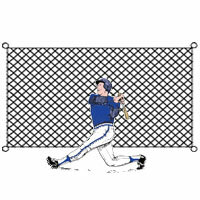 #36 netting is .085 in diameter and has 320 lb. Twine test.